January 10, 2019 -- A multi-institutional team has developed an automated treatment planning system for intensity-modulated radiation therapy based on 3D dose prediction and dose distribution-based optimization. In a recent study, the researchers demonstrated that the deep-learning-based method shows promise for generating highly individualized radiotherapy plans optimized for precision and quality. Treatment planning software packages that use knowledge-based techniques to estimate dose-volume histogram (DVH) objectives are commercially available. But according to the authors, such methods do not provide reasonable estimates of patient-specific achievable dose distributions. They pointed out that because a large number of dose distributions satisfy the same DVH objectives, this may result in plans with acceptable DVH objectives but unacceptable dose distributions in some areas of clinical concern. Dose distributions for a head and neck cancer patient. Left column: predicted plan; center: automatic generated plan; right: voxel-by-voxel difference maps. Images courtesy of Medical Physics (10.1002/mp.13271). 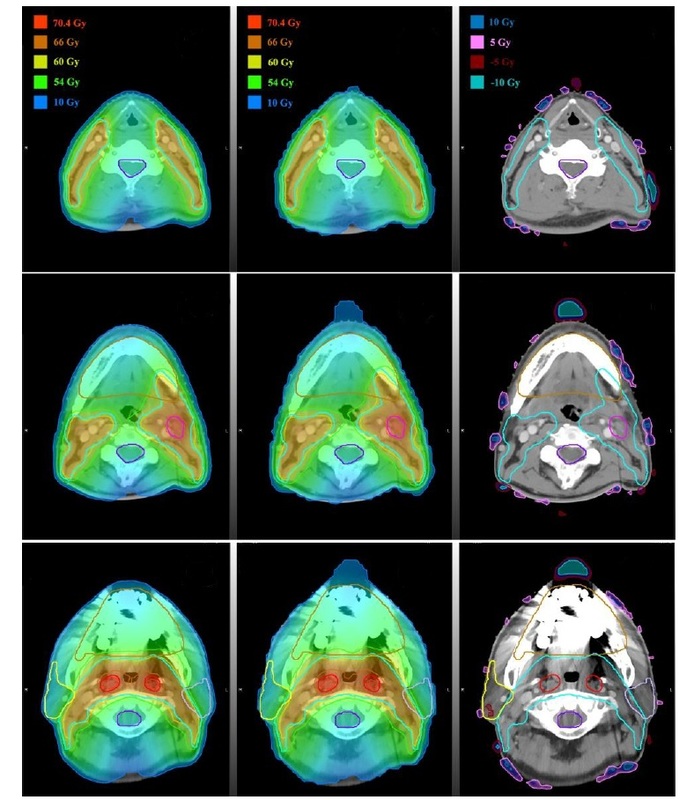 Lead author Jiawei Fan from Fudan University Shanghai Cancer Center and colleagues have presented a deep-learning method for 3D dose prediction for head and neck cancer treatments. The system provides estimates of DVH objectives and also gives voxel-level feedback to planners showing where the dose distribution could be improved. To predict the achievable dose matrix for a given patient anatomy, the researchers developed a residual network-based framework trained to correlate voxel geometry to voxel dose. The input data for the network were acquired from individual transaxial CT slices of the patient's anatomy; the output was the dose matrix for each slice. The model also included data from two additional images: an image of the planning target volume describing its region, shape, and size; and an image describing the shape, size and relative position of 12 organs at risk. These organs included the brainstem, spinal cord, right and left parotid glands, right and left temporal lobes, right and left lenses, right and left optic nerves, chiasm, and oral cavity (Medical Physics, 1 November 2018, 10.1002/mp.13271). Each training sample included consisted of one CT image, two delineation images, and one dose distribution image. The researchers utilized data from 270 patients who underwent IMRT for head and neck cancers. They subdivided the dataset into a training set of 195 patients, a validation set of 25 patients, and a testing set of 50 patients. After training and testing their deep-learning model, the researchers compared the predicted dose distributions and DVH curves with results calculated by the treatment planning system. The results demonstrated that the deep-learning method could predict clinically acceptable dose distributions. Tests on a range of different prescription patterns with a large number of plans revealed that the automated plans were comparable with those that had been manually generated by dosimetrists. The authors noted that one distinctive feature of their method is its ability to obtain acceptable predictions for prescription doses that were not included in the training set. The model can also be used on patients with several planning target volumes that have different prescription doses. The researchers are currently investigating the applicability of voxel-based dose prediction for other cancer cases. They are also working to improve the predicted results for small-volume organs at risk by using a training set with consistent clinical priorities and plan qualities to train the deep-learning network. "The proposed automated treatment planning strategy opens up the possibility of a voxel-by-voxel cost optimization system and eliminates the need to convert a desired dose distribution to DVH values," the authors concluded. "In the future, it would be a dramatic improvement if a physician's clinical intent could be directly reflected in the target dose for each voxel through a treatment planning interface designed to make use of the predicted 3D dose distribution." Cynthia E. Keen is a freelance journalist specializing in medicine and healthcare-related innovations.